PI (Physik Instrumente) signed a contract with the European Southern Observatory, ESO for supplying the actuators for the world's largest telescope, which is being built in Chile. The Extremely Large Telescope, in short ELT, of ESO will have a segmented main mirror with a diameter of 39 m and a light collec-tion area of almost 1000 m² and will be the largest telescope for scientific evaluation of electromagnetic radiation in the visible and near-infrared wavelength range. 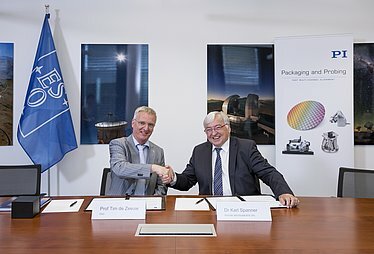 "The main reflector is a miracle of modern technology" says Tim de Zeeuw, director general of ESO during the signing of the contract at ESO headquarters in Garching, Germany. The main reflector is to be made up of 798 individual hexagonal segments. Each of these segments will have a diameter of 1.40 meters and weigh 250 kg. The actuators from PI are used both for fixing the segments to the supporting structure and aligning them exactly to each other. Only high-precision adjustment of the mirror segments makes it possible to compensate deviations from the optimum beam path, which for example, occur as a result of changes to the height of the telescope, thermal effects or wind force. 2.394 actuators are required for these tasks. To meet the high technical requirements of the project, PI developed a tailor-made actuator and controller concept. The actuators are based on a hybrid drive principle that consists of a motor-spindle drive and piezo actuator. Any inaccuracies of the motor-spindle drive can be measured with a high-resolution sensor and corrected using the piezo actuator. This ensures the extremely high positioning accuracy. A dedicated controller controls both drives simultaneously and also controls the high-resolution position measuring system. This concept, the implementation, and the quality of the products convinced ESO. "We are proud and very pleased to have received the order for this large project and therefore continue our longstanding and successful cooperation", explains Dr. Karl Spanner, President of PI. The ELT will have first light on top of the 3,046-meter high Cerro Amazones in the Chilean Atacama Desert during 2024. One of the most important tasks of the telescope is to help us to find out more about exoplanets, i.e., planets that exist beyond the solar system. Well known for the high quality of its products, PI (Physik Instru-mente) has been one of the leading players in the global market for precision positioning technology for many years. PI has been developing and manufacturing standard and OEM products with piezo or motor drives for more than 40 years. In addition to four locations in Germany, the PI Group is represented internationally by fifteen sales and service subsidiaries.